At 7:15pm sharp, a member of the cinema staff opens the door and welcomes us in. Shooting Clerks writer and director Christopher Downie is joined by producer Ryan James in front of the screen. The pair explain their last minute decision to reverse the running order, showing the original Clerks (1994) followed by Shooting Clerks (2016), and that they’ve never actually watched the two films back-to-back before. They ask if anyone has never seen Clerks. A smattering of hands are raised. The rest of the auditorium turn to give them encouraging looks – everyone knows that they’re in for a treat. Clerks opens with the now iconic View Askew vanity card, and the audience settles into their seats contentedly. There’s joy to be had in enjoying this cult hit in a cinema surrounded by laughing fans, rather than half-watching it on a laptop at a winding down house party. The short scenes and quick dialogue mean that there’s always something new to enjoy; Smith packs so many witticisms into 92 grainy monochrome minutes that Clerks stands up well to multiple watches. Iconic lines (“What kind of convenience store do you run here?”) raise a hearty laugh from new viewers and certified Kevin Smith geeks alike. On the surface, you’d be forgiven for thinking Clerks relies on smutty laughs and a DIY aesthetic, but its true charm runs much deeper. Even without much knowledge of the back story, everything about the film feels authentic. The cast have the chemistry you’d expect from real life friends, and the dialogue could only have been written by someone who really does work in a convenience store. An unacquainted viewer is left with some questions though: Why black and white? Is this as low budget as it looks? And who is this Silent Bob character? The team behind Shooting Clerks have the answers. There is a short break to grab a beer and a bag of fresh popcorn from the bar, then Downie and James introduce their film, encouraging the audience to look out for the twenty cameos (with more still to be added in later cuts of the film). UK screenings of Shooting Clerks have been long awaited – it only premiered last week at The Prince Charles Cinema in London. Rather than the obvious documentary style, the film follows a biopic format. It’s not often you see a biopic where everyone portrayed is still alive to pass comment, but Downie is lucky enough to have Kevin Smith’s support. 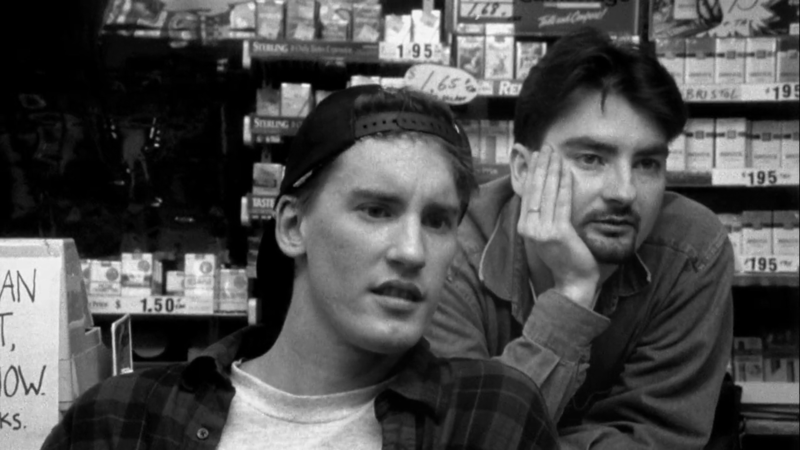 The film tells the story behind Clerks, a tale which is now the stuff of indie cinema legend. We see a young Kevin Smith skipping school to go to the cinema with his father (played by Scott Schiaffo, the Chewlies gum representative in the original Clerks). An older, more familiar Smith is excellently played by Mark Frost. We see him working in the real convenience store where Clerks was filmed by night. We see the fabled credit cards used to raise the $27,000 budget for a film that would go on to gross $3 million at the box office. We even see the birth of Jay and Silent Bob. Shooting Clerks is a film with a lot of heart. After showing them working day and night, Downie concludes with scenes of the Clerks crew celebrating the sale of the distribution rights to the dubiously named Harry Weizmann of Mirimax Films. Shooting Clerks is a film about making a film with your friends – with whatever means you can get your hands on. When asked about their favourite Kevin Smith film, it’s a surprise to see that the crew almost unanimously agree on Clerks II. Maybe another biopic is in the works, then?